Where is nearly all of the drilling action in Utah taking place? The answer is Natural Buttes field in the eastern Uinta Basin south of Vernal where over a hundred new wells are drilled each year. Natural Buttes field, the largest gas field in Utah, has produced over 2.1 trillion cubic feet of gas from about 4000 wells. Why is Natural Buttes field so large? It covers a huge area underlain by many layers of gas-bearing rock (gas reservoirs) where all the right conditions existed for large deposits of natural gas to accumulate. Why are so many wells being drilled there? The size of the field area and the unusual nature of the reservoir rocks require many closely spaced wells, using stateof-the-art drilling and completion technology to economically produce the gas. Is the Utah Geological Survey (UGS) conducting any research in the area? In fact, the UGS is assisting with a major project on Natural Buttes, with and under the direction of reservoir engineers and modelers at the University of Utah. The study is funded by the Research Partnership to Secure Energy for America (RPSEA) and also involves Utah State University, software companies, and industry participants. 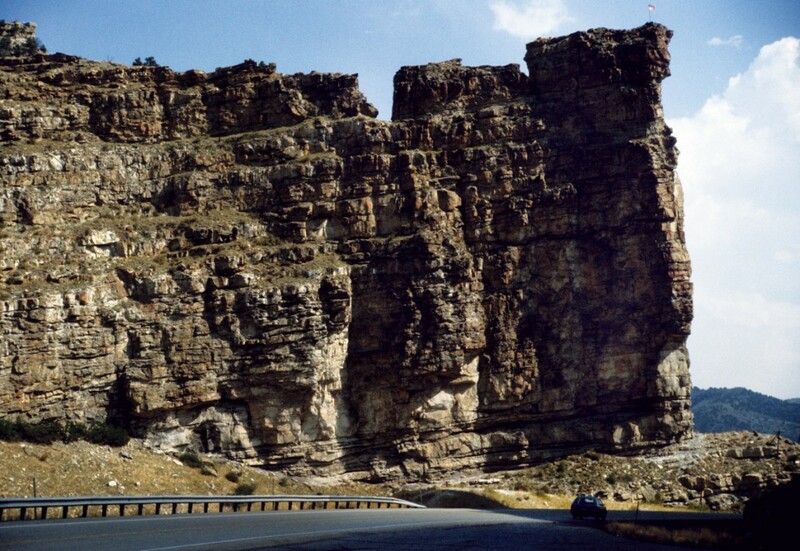 Natural Buttes, and other fields in the eastern Uinta Basin, produce natural gas primarily from sandstone in the Cretaceous Mesaverde Group (70–80 million years old) and the Tertiary Wasatch Formation (52–56 million years old). Gas is stored in pores within very fine grained sandstone (the reservoir rock). The connectivity of the pores (permeability), which allows gasor liquids to flow, is very low. This hinders the ability of the rocks to release the stored gas, and thus the reservoir rock is referred to as “tight” sandstone. During much of Cretaceous time, a warm, shallow, inland sea extended from Canada to the Gulf of Mexico across the North American continent, including eastern Utah. Most of the gas production from Natural Buttes field is from highly compartmentalized, discontinuous, lens-shaped sandstone bodies deposited in channels and as sandbars along rivers flowing eastward across a coastal plain from ancient mountains (the Sevier orogenic belt) in western Utah toward the inland sea during Late Cretaceous time. Other sandstone beds represent a nearshore marine setting. The gas was generated and expelled from older Cretaceous coal beds (originally swamps and marshes) after deep burial in the basin. Rocks of the Mesaverde Group and Wasatch Formation are exposed at the surface in the cliffs and deep canyons along the southern rim of the Uinta Basin, and are inclined gently northward such that in the basin center they are deeply buried. In Natural Buttes and other gas fields within the basin, individual wells typically penetrate multiple, vertically stacked, tight sandstone beds, each capable of producing gas. 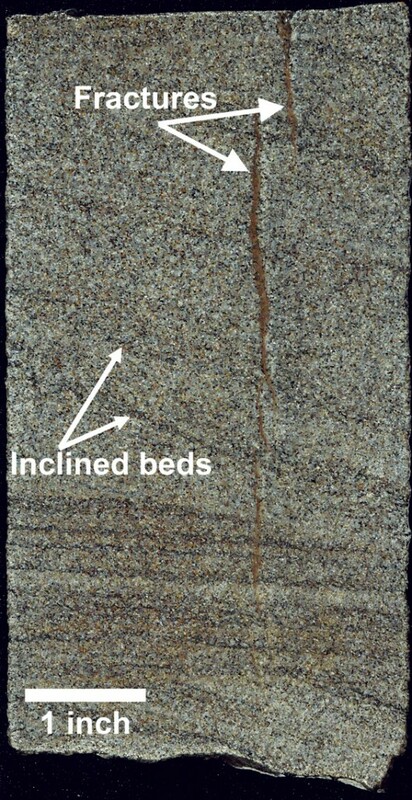 These beds may be in direct contact with each other or be separated by very thin to thick, extremely low-permeability siltstone andshale that act as either barriers or baffles to fluid flow. Natural fractures in the reservoir rocks increase both their porosity and permeability. The discontinuous nature of these tight sandstone bodies is seen in outcrop and in seismic profiles from Natural Buttes field. The sandstone beds that produce in one well are often completely different and separate from sandstone beds in another well, even if the distance between the two wells is only a few thousand feet. Thus, field development at Natural Buttes requires drilling dozens of closely spaced wells each year. Four to six wells are often completed from the same surface location by directionally drilling to the targeted intervals at depth. This practice saves drill-site construction costs and reduces the environmental footprint of development. The lateral and vertical reservoir characteristics such as thickness, degree of porosity and permeability, fractures, and internal barriers and baffles to fluid flow, determine where a well is drilled and the plan as to how it will best produce. Gas production from tight sandstone reservoirs requires mechanically increasing the number of fractures for the wells to produce at commercial rates and amounts of gas. This is accomplished by hydraulic fracturing techniques (also used to develop shale-gas reservoirs described on p. 3) that havebecome significantly more effective over the past 10 years. Water and minor amounts of chemical compounds are pumped down the well under pressures high enough to locally fracture the sandstone, thereby increasing both the porosity and permeability and allowing the trapped gas to flow to the well. Hydraulic fracturing is usually conducted in several stages, moving from sandstone bed to sandstone bed up the well. To keep the natural and new open fractures from closing due to the pressure of the overlying rock layers, sand or other porous materials of various sizes (called proppant) is also pumped into the fractured zones. Understanding the natural fracture systems and reservoir characteristics created by various depositional environments can aid in optimizing hydraulic fracturing and lead to more effective drilling and completion strategies. Cores in the Castlegate, Sego, and Price River Formations of the Mesaverde Group, for example, display classic tight sandstone characteristics including porosity, permeability, and natural fractures that the UGS is evaluating to assist with the creation of new reservoir models and simulations for hydraulic fracturing. For more information, visit our Web page at geology.utah.gov/emp/tightgas/index.htm.